Financial Express features Raghwesh Ranjan speaking on "Air Pollution in Delhi NCR"
An exclusive coverage of Raghwesh Ranjan, Director of Social and Economic Development with Financial Express, 24th November, 2018. 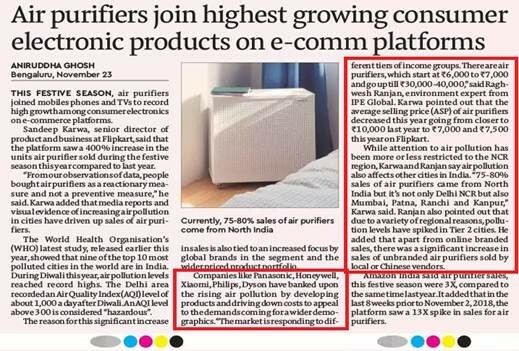 He shared his views on “Air Pollution in Delhi NCR and how air-purifiers joins the highest growing consumer electronic products on e-comm platforms”. The quote follows “According to the World Health Organisation’s (WH0) latest study released earlier this year, showed that nine of the 10 top most polluted cities in the world are in India. Air Pollution has been more or less restricted to the NCR region, due to variety of regional reasons pollution levels have spiked in Tier 2 cities and about 75-80% sales of air purifiers sales have been increased due to this”.